Cartes de visite were small photos mounted on card about 3.5 ins x 2.25 ins. These were popular in the mid- to late-1800s, but the subjects chosen by most photographers (including John Moffat) was usually studio portraits. However, here is one of John Moffat's landscape cartes de visite. 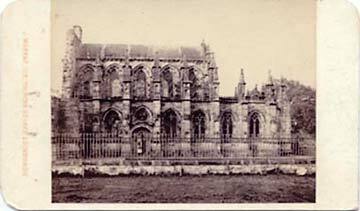 The subject is Roslyn Abbey (usually referred to as Rosslyn Chapel). It is and now far better known following the recent publication of the book and film The Da Vinci Code. Roslyn Abbey is about 7 miles to the south of the centre of Edinburgh. 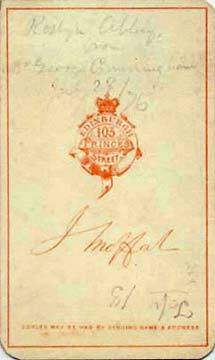 The address on the back of this carte de visite is 103 Princes Street. This was the address of John Moffat's studio from 1861 until 1876. It then became the studio of Ross & Pringle for a further 7 years. The carte de visite above must have been one of the last taken while John Moffat was at 103 Princes Street. The date on the back of the photo, written in pencil, is July 25 (18)76. The photographic business of John Moffat continued to operate from 125, then 126, Princes Street until 1962 - a hundred and nine years after his business began. Photos - other famous people?